Charming Hope Valley area 3 bedroom 2 bath ranch home nestled on .52 acre lot. Inviting family room w/ built in bookshelves, gas log fireplace & large picture windows overlooking private backyard. Spacious eat in kitchen has pantry & plenty of cabinet space for extra storage. Hardwood floors throughout home including formal living & dining rooms and bedrooms. Oversized patio overlooks the backyard with privacy fence. Excellent location! Perfectly positioned between Durham, Chapel Hill & Southpoint Mall. Fireplace(s): Gas Logs, In Family Room, Masonry (1 total). Directions:Take I40W to exit 274 for NC-751 toward Jordan Lake. Turn right onto NC-751 N. Turn left onto Garrett Rd. Turn left onto Colorado Ave. Turn right onto Woodberry Rd. SchoolsClick map icons below to view information for schools near 5605 Woodberry Drive Durham, NC 27707. Home for sale at 5605 Woodberry Drive Durham, NC 27707. 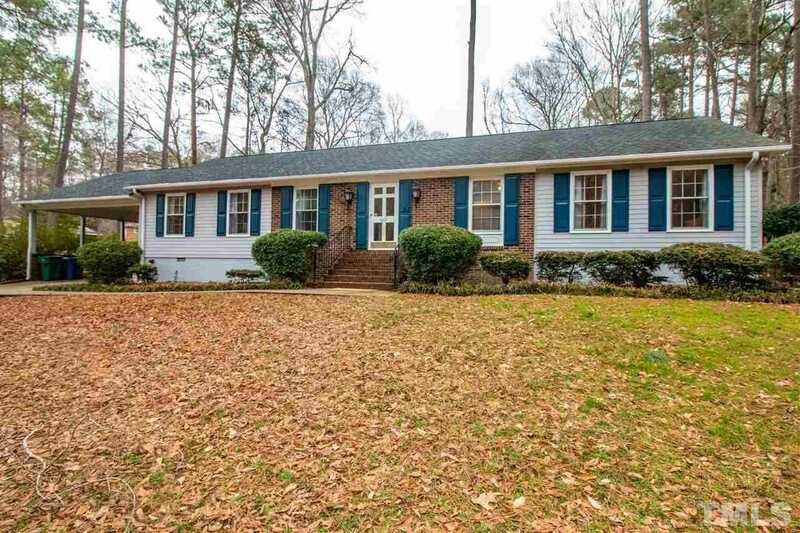 Description: The property at 5605 Woodberry Drive Durham, NC 27707 in the Woodberry Forest subdivision with the MLS# 2236351 is currently listed for $315,000 and has been on the market for 66 days. You are viewing the Triangle MLS listing details of the home for sale at 5605 Woodberry Drive Durham, NC 27707, which features 3 bedrooms and 2 bathrooms, and 1851 sq.ft. of living area.